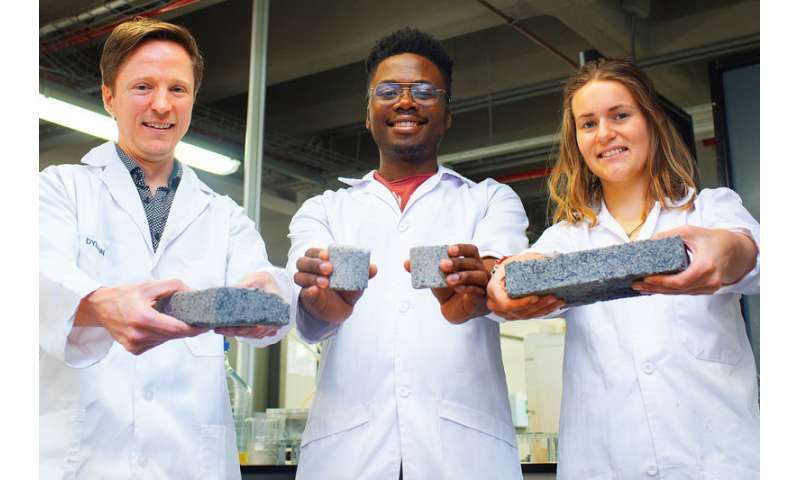 The world's first bio-brick grown from human urine has been unveiled by University of Cape Town (UCT) master's student in civil engineering Suzanne Lambert, signalling an innovative paradigm shift in waste recovery. The bio-bricks are created through a natural process called microbial carbonate precipitation. It's not unlike the way seashells are formed, said Lambert's supervisor Dr. Dyllon Randall, a senior lecturer in water quality engineering. In this case, loose sand is colonised with bacteria that produce urease. An enzyme, the urease breaks down the urea in urine while producing calcium carbonate through a complex chemical reaction. This cements the sand into any shape, whether it's a solid column, or now, for the first time, a rectangular building brick. For the past few months Lambert and civil engineering honours student Vukheta Mukhari have been hard at work in the laboratory testing various bio-brick shapes and tensile strengths to produce an innovative building material. Mukhari is being co-supervised by Professor Hans Beushausen, also from the civil engineering department. Beushausen is helping to test the products. The development is also good news for the environment and global warming as bio-bricks are made in moulds at room temperature. Regular bricks are kiln-fired at temperatures around 1 400°C and produce vast quantities of carbon dioxide. "If a client wanted a brick stronger than a 40 percent limestone brick, you would allow the bacteria to make the solid stronger by 'growing' it for longer," said Randall. "The longer you allow the little bacteria to make the cement, the stronger the product is going to be. We can optimise that process." The concept of using urea to grow bricks was tested in the United States some years back using synthetic solutions, but Lambert's brick uses real human urine for the first time, with significant consequences for waste recycling and upcycling. Her work builds on foundational research by Jules Henze, a Swiss student who spent four months working with Randall on this concept in 2017. "It's what I love about research. You build on the foundations of other work," said Randall. In addition, the bio-brick process produces as by-products nitrogen and potassium, which are important components of commercial fertilisers. Chemically speaking, urine is liquid gold, according to Randall. It accounts for less than 1 percent of domestic waste water (by volume) but contains 80 percent of the nitrogen, 56 percent of the phosphorus and 63 percent of the potassium of this waste water. Some 97 percent of the phosphorus present in the urine can be converted into calcium phosphate, the key ingredient in fertilisers that underpin commercial farming worldwide. This is significant because the world's natural phosphate reserves are running dry. The fertilisers are produced as part of the phased process used to produce the bio-bricks. First, urine is collected in novel fertiliser-producing urinals and used to make a solid fertiliser. The remaining liquid is then used in the biological process to grow the bio-brick. "But in that process, we're only after two components: carbonate ions and the calcium. What we do last is take the remaining liquid product from the bio-brick process and make a second fertiliser," he explained. The overall scheme would effectively result in zero waste, with the urine completely converted into three useful products. "No-one's looked at it in terms of that entire cycle and the potential to recover multiple valuable products. The next question is how to do that in an optimised way so that profit can be created from urine." There are also logistics to be considered; urine collection and transport to a resource recovery. Randall has discussed these opportunities in a recent review paper on urine. Another of his master's students is investigating the transport logistics of urine collection and treatment with some very promising results. Social acceptance is another consideration. "At the moment we're only dealing with urine collection from male urinals because that's socially accepted. But what about the other half of the population?" In the run-up to unveiling the bio-brick, both students expressed optimism about the potential of innovation in the sustainability space. "This project has been a huge part of my life for the past year and a half, and I see so much potential for the process's application in the real world. I can't wait for when the world is ready for it," Lambert said. "Working on this project has been an eye-opening experience. Given the progress made in the research here at UCT, creating a truly sustainable construction material is now a possibility," Mukhari added. Randall said the work is creating paradigm shifts with respect to how society views waste and the upcycling of that waste. "In this example you take something that is considered a waste and make multiple products from it. You can use the same process for any waste stream. It's about rethinking things," he said. I see what she did there. (If your urine is not a lovely golden yellow, you might wish to consult a physician.) It would seem that farm animals could be a huge target for urine collection and processing, maybe more so than humans. Regular bricks are kiln-fired at temperatures around 1 400°C and produce vast quantities of carbon dioxide. Not only that, but since the process yields calcium carbonate, wouldn't it be directly (during the process) or indirectly (from the urine) pulling carbon out of the atmosphere and sequestering it in these bricks? As ideas go, this one is piss poor. Reminds me of that other "brilliant" idea where they use chemicals to dissolve away everything that gives wood its strength and natural beauty and then replace it with plastic. If they can use feces to make bricks then the euphemism "shitting bricks" becomes an actual thing! I suppose that feedlots, dairy barns, stables, etc. would be interested. If implemented, this might reduce phosphate runoff from livestock farms. Manure is essentially a soft solid, but urine is a liquid that might be difficult to harvest. I volunteer annoyingmousie for employment as a stockyard piss collector! Think of the hilarious youtube footage we could get! One question about the fertilizer output. What happens to the drugs that are showing up in greater and greater quantities in our waste? Urine>fertilizer>food> to us seems like an issue that must be resolved. That said this should be an obstacle we could overcome.